Party Solutions wants to be YOUR personal party rental provider!Party Solutions has been part of the event planning industry since 1997. 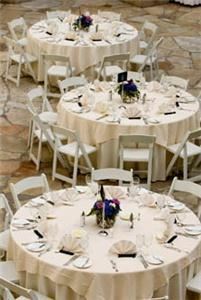 It is our goal to eliminate the stress in planning your next event. Simply providing a product is not enough. Our products will always be the best quality for the value. Equipment will be maintained to like new condition and always kept clean. Quality is the final impression our customers experience after receiving superior service. We look forward to earning your business for many years to come. We take the extra step in customer service, at party solutions we are not your standard drop off rental company. All prices include our effortless setup commitment. Not only do we guarantee a 1 hour arrival window but Party Solutions will also setup your tables, chairs and tents in your desired location included in your rental rate. Great overall experience! Would recommend and use again.